Featured / Stories / 30.04.2014. There are many names of this pie such as soparnik, zeljenik, uljenak and blitvenjak. It is a traditional dish of Dalmatian Zagora. It dates back from the times of Republic of Poljica. This historical name refers to the eastern region from Split, stretching out from Žrnovnica till Blato on river Cetina and Omiš and to the sea till Zamosorje. Republic of Poljica was an autonomous community organized as “peasants’ republic”. It proclaimed its independence in the 13th century and it lasted till the invasion of Napoleon army in the beginning of the 19th century. The name comes from the numerous fields that surround mountain Mosor and consists of three villages Donji (Lower), Srednji (Middle) and Gornji (Upper) Poljice. The boundaries of the Republic of Poljice were defined by the Poljica Statute first written in 1482. This republic was ruled by knez (prince) who would be chosen to rule for one year. Soparnik used to be a dry and plain dish that was prepared at times of fasting and few days before All Saints day. Field workers used to wrap it in leather and carry it in their backpack. It would be their meal during breaks after hard work and they used to drink a bit water with wine vinegar. That would refresh them and give them energy for hard labor. A day before chard is picked, and cut into stripes. It’s left over night to dry on the tablecloth so that soparnik wouldn’t crack because of excess water. An hour before baking, a fire is started, using ash, oak and beech wood with plenty of ashes and ember. Komin (part of the fireplace where fire burns) shouldn’t be too hot, so that the back side of soparnik wouldn’t burn. For dough combine flour, salt and water and let the dough rest a bit. 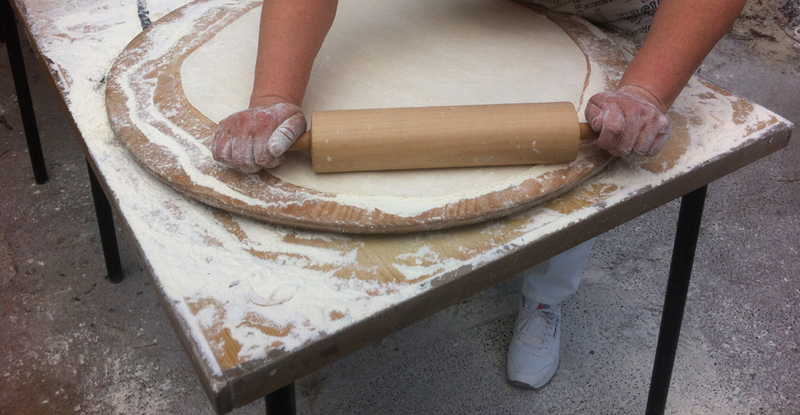 Then the dough is split in two halves and rolled out with dough roller on the surface sprinkled with flour. On the lower layer of dough spread the filling made of chard, olive oil, leek and salt. It is covered with the upper layer of dough and the edges of dough are twisted so that the pie is sealed and the filling does not spill out. 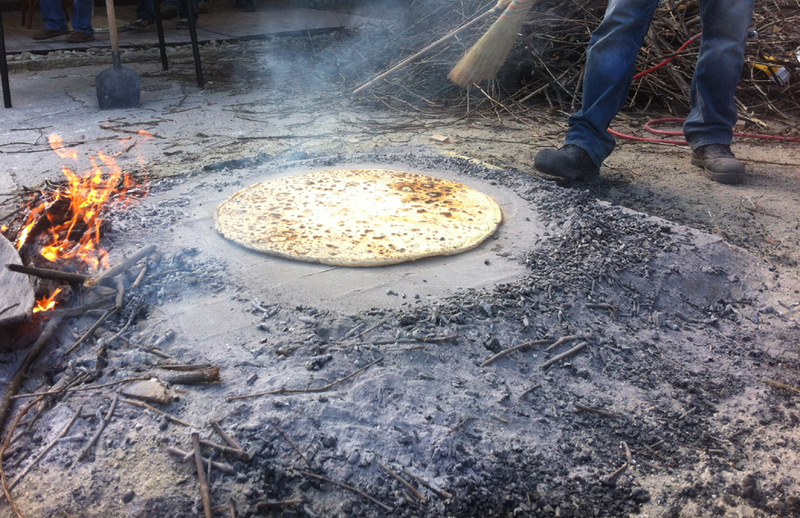 Upper layer of dough is sprinkled with flour, poked few times with a fork to let the steam out and covered with the wooden plate and put to the fireplace stand. 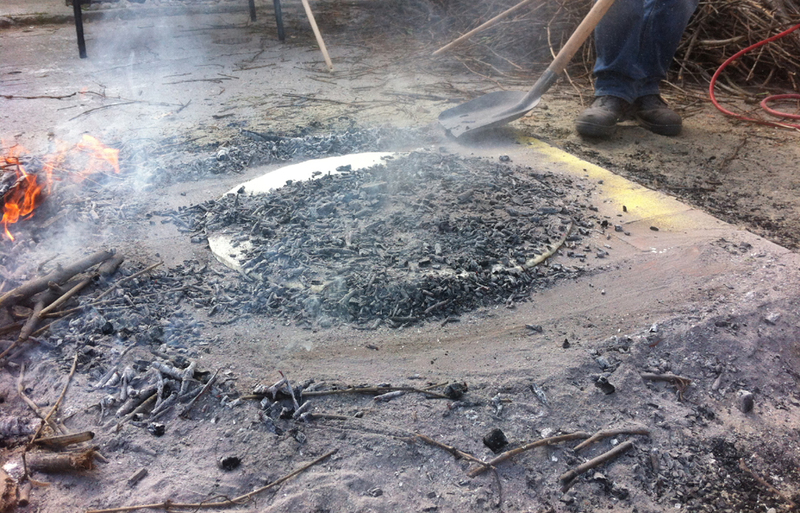 Upper wooden plate is removed and soparnik is carefully removed from the wooden plate and placed on the cleaned hot stone surface, and covered with ashes and ember. 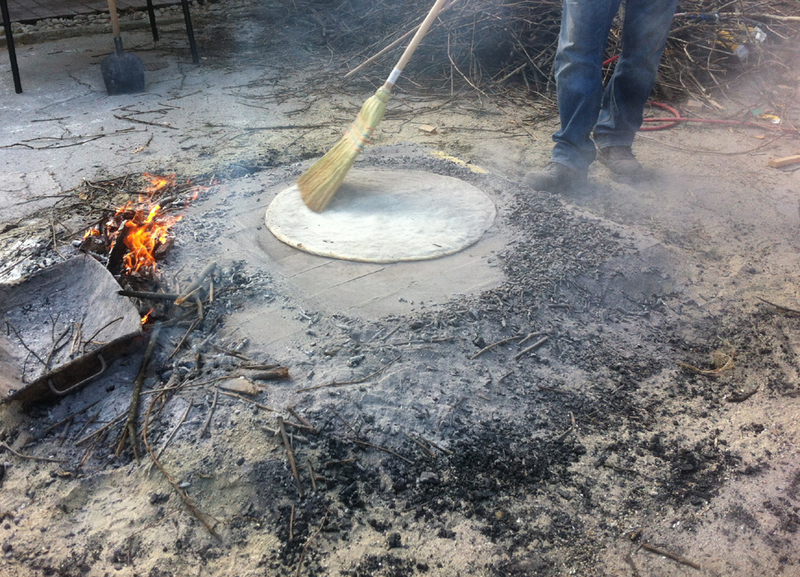 It is baked under ashes that are put on the soparnik with little spatula for about 15 minutes. After about 10 minutes soparnik is cleaned and turned over. 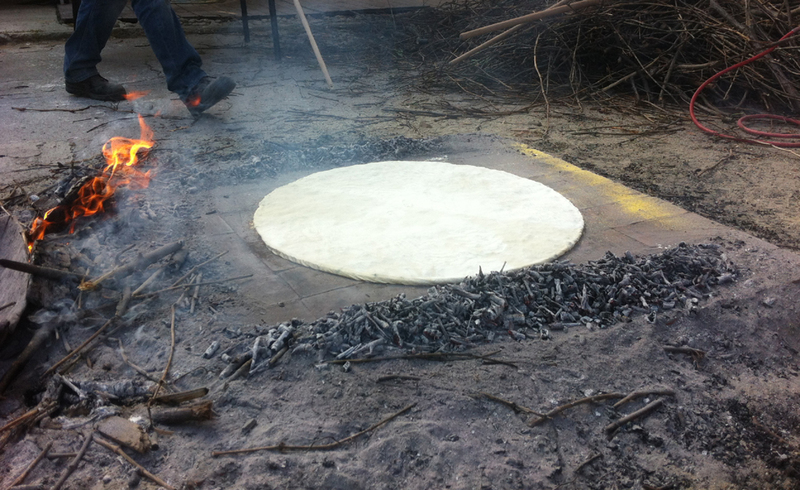 Again the ashes are put on the top of half-baked soparnik. 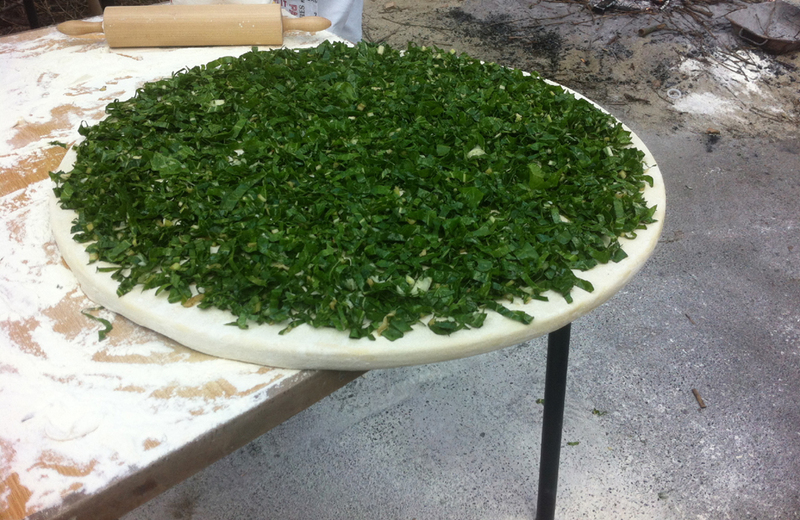 When it is baked, ashes are removed and soparnik is spread with olive oil and chopped garlic. Soparnik is cut in rhombus shaped pieces starting from the middle. The honor guest gets the first piece from the middle. The wine is served in a jug (bukara) so that four pieces are cut out of the middle and the jug with wine is placed in the middle. 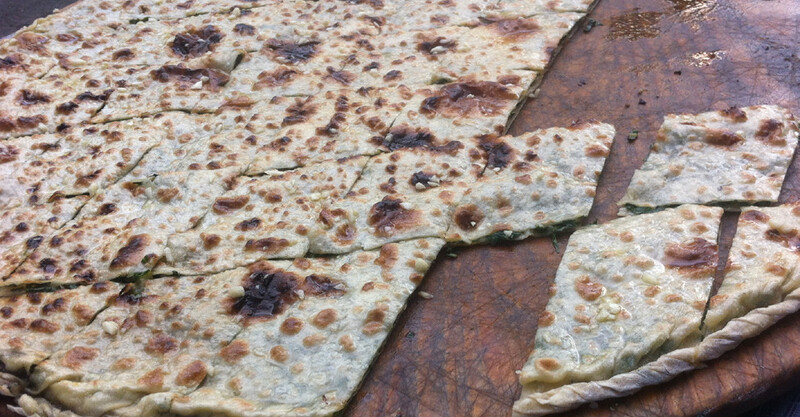 Babice – soparnice is the name for leftover part of soparnik made of chard and dough. Usually they are smaller and irregular in shape than regular soparnik. The inhabitants of the Croatian islands used to add fresh leaves of fennel and grated sheep cheese to the chard filling. 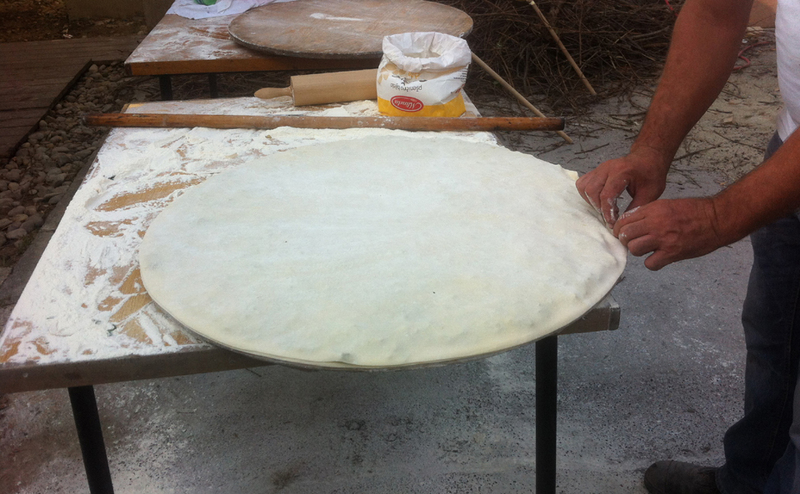 Preparation of Poljicki soparnik has been listed among the Cultural Goods of Croatia. Recipe in homemade version is available here. I was fortunate enough to have this wonderful dish during the mid 90’s through 2001 when I visited my good friends in Zrnovnica. The mother of the family made this and it was superb. Reading this article brought back many happy memories of the village and my friends. Thank you!